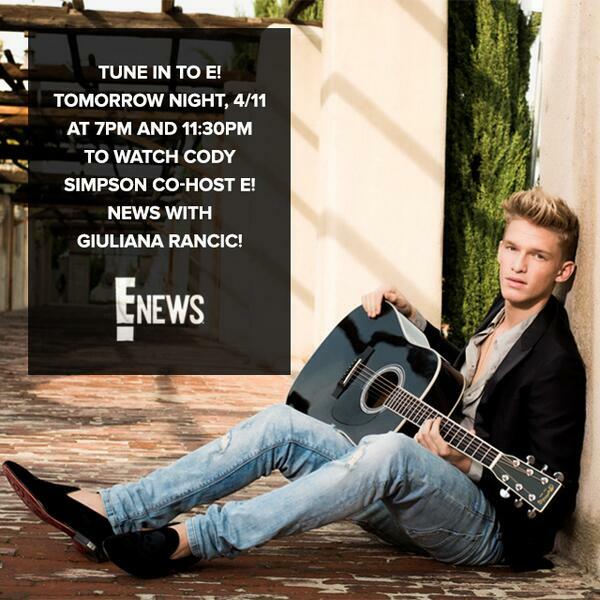 Cody Simpson Is Co-Hosting E! News Tonight! Cody Simpson may be super busy with his gig on ABC’s Dancing With The Stars and working on his music but luckily, we will get to see more of Cody despite his busy schedule has he will be co-hosting as a guest on E! News along with Giuliana Rancic. Cody will appear as the c-host tonight at 7 PM and 11:30 PM! We are excited to see what Cody will be talking about and of course we can’t wait to get some celebrity news from Cody himself! Be sure to tune to E! News tonight. Also, Cody has been letting his fans know on Twitter that his music video for his new single “Surfboard” is coming soon so be sure to check back with us for the upcoming music video!